Ever wondered what the SPF number meant on your sunscreen bottle? Sun protection factor (SPF) is a measurement used for determining a sunscreens effectiveness against ultraviolet rays (UV rays, or UVR). There are three different types of UV rays, but UVB is what causes sunburn. When we look at the number associated with SPF, it provides us information on how much UVB protection we get. A common myth about SPF is that the higher the number the better, but after a certain point the percentage of protection becomes insignificant. SPF 15 indicates that 1/15 parts of UVB will penetrate the skin after you have placed the sunblock. That means that 93% of UVB is blocked. SPF 50 has 1/50 parts of UVB that will penetrate and 98% of UVB will be blocked. If we compare SPF 70 vs SPF 50, there is only a slight increase in the amount of UVB blocked. SPF 70 will block 98.5% of UVB and only 1/70 parts of UVB will penetrate. We can see that SPF 15 and SPF 50 provides a 5% increase but SPF 50 compared to 70 only had a 0.5% increase. When choosing a sunscreen shoot for SPF 50 or higher for best coverage. Community Farmacy carries sunscreen without the harsh or toxic chemicals! 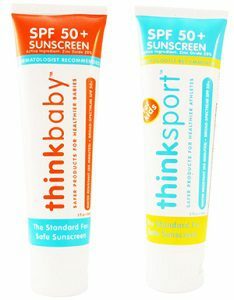 It contains no PABA, parabens, phthalates, BPA, Oxybenzone, Avobenzone, petroleum, dioxane or toxic chemicals. The sunscreen works by reflecting and scattering the incoming UV rays.